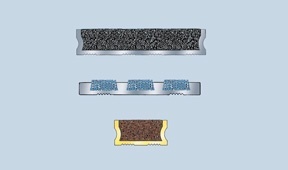 Stair treads or nosings are made from non-slip silicon carbide or other special non-slip materials to help ensure pedestrian safety. 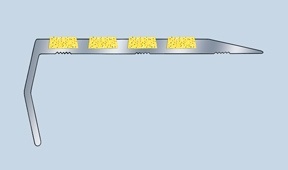 What Latham refers to as stair tread nosings are sometimes also referred to as Latham treads, step treads, anti-slip nosings, slip resistant nosings, or step nosings. Essentially they all have the same function, which is to improve visual contrast & grip on stairways to promote pedestrian and public safety. Latham Asbraloy Aluminium and Asbrabronz Solid Brass safety stair tread nosings are suitable for both internal and external applications. We manufacture a wide range of profiles to be architecturally appealing for various applications. These profiles also are designed to accommodate the requirements of different Australian and international standards and building codes. 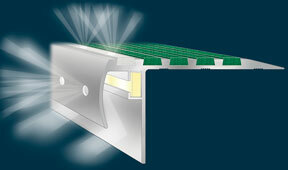 What Are Asbra Safety Nosing Stair Treads Used For? Anti-slip nosings for stairs and other constructed surfaces such as platforms, walkways, and ramps, reduce the risk of pedestrian slips and falls and enhance public safety. For building owners, this helps reduce the potential for litigation as a result of a slip or fall. Non-slip stair treads in residential and commercial properties are therefore an important part of meeting Occupational Health and Safety (OH&S) requirements. They also protect underlying floor surfaces from costly damage through continual wear and tear. According to industry standards set out by the Building Code of Australia, non-slip and non-skid surfaces must be installed on all pedestrian ramps, stairs, and landings, particularly in areas that receive heavy foot traffic or where emergency access may be required. Slip resistant tread nosings are also critical to meeting disability standards for safe access to premises for the visually impaired or disabled.  All of our residential and commercial stair nosings are suitable for both new construction and existing installations. They are available in a range of profiles to suit various flooring finishes including stone, tile, timber, terrazzo, concrete, pavers, brick, vinyl, and carpet. To ensure they suit the chosen application without affecting the architectural aesthetic, they are also available in a wide range of colours and styles and can either be surface mounted or recessed. Latham has taken the hard work out of ensuring compliance with Australian standards for stair treads by putting together a comprehensive compliance checklist for our customers. The thoroughly researched checklist is available for download here. 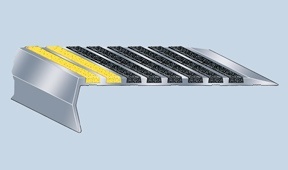 Asbraloy ST Series Surface Mounted Safety Stair Tread Nosings are designed to be installed in existing applications, where a possible hazard has been identified or where pedestrian safety becomes of paramount concern. The system can be installed on just about all flooring finished including stone, tile, timber, terrazzo, concrete, pavers, brick, vinyl and carpet. 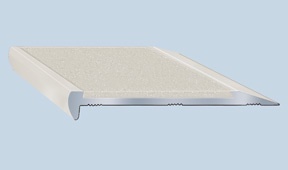 Asbraloy S Series Recessed Safety Stair Tread Nosings are designed for new and existing applications where pedestrian safety, stair appearance and stair longevity is of particular concern. The systems can be recessed into new work or recessed into existing floor finishes. 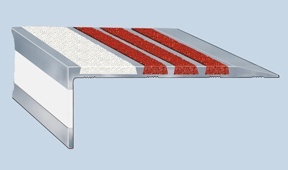 Asbraloy SB Series Bevelled Edge Safety Stair Tread Nosings are designed for new applications where pedestrian safety, stair appearance and stair longevity is of particular concern. 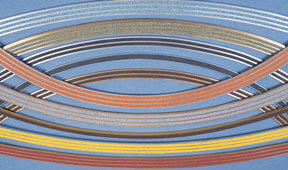 The system can be installed into new work and are designed for installation with carpet and vinyl applications. 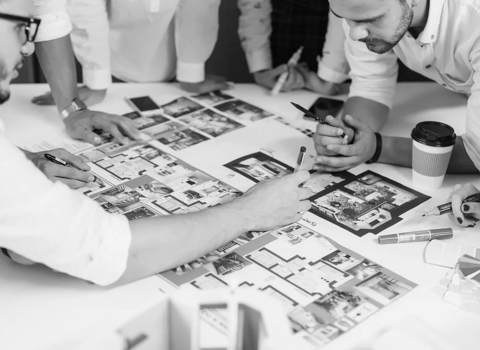 There are many varied and contradictory standards in Australia and through-out the world, Latham strive where possible to meet these and are constantly updating our range to address the sometimes unforeseen and unexplained changes to various Standards. These stair treads are designed to meet & exceed the demands of AS 1428.1-2009 with regards to width & depth, while still maintaining the safety features to which Latham are synomous. Although there are many varied and contradictory standards in Australia and through-out the world, Latham strive where possible to meet these and are constantly updating our range to address the sometimes unforeseen and unexplained changes to various Standards. In relation to the updated standard AS 1428.1-2009, these profiles meet the width and depth requirements set out in this standard. 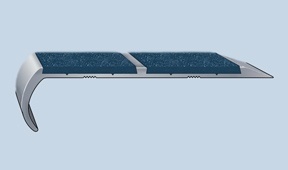 Asbraloy Cast-In Place Safety Stair Tread Nosings are designed for new applications where pedestrian safety and stair longevity is of particular concern. The systems can be installed into the wet concrete topping. 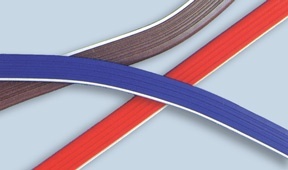 All SK Series Cast-In Place Safety Stair Tread Nosings are suitable for internal or external applications and are available with a wide range of insert colours. The EHD Extra Heavy Duty Repair System is designed to provide complete versatility. The interchangeable varying width extension sections can be used to completely cover steps and landings without the need for matching floor materials and will be safe and elegant for years to come. 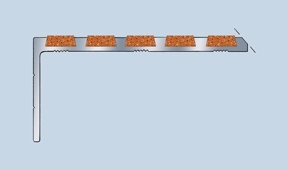 The VS-VB Extra Visual Stair Tread Nosings come in 12 profiles. All have the new Latham 25mm Safety Visual Indicator Bar, which should contrast with the surrounding floor finish. 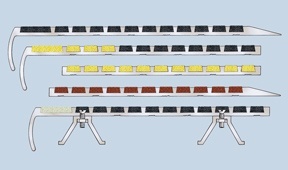 The 744 and 994 Series can include the new bullnose indicator strip which is available with an 18mm sight line. 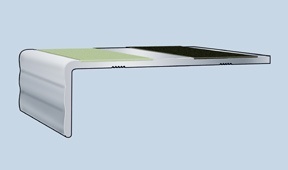 The visual bullnose indicator can be replaced with a different indicator colour at any time. The range of Latham Special Application Safety Stair Tread Nosings have been developed to fill the need for a safety nosing that is not only practical, but also an attractive way of enhancing visibility on the leading edge of stairs and steps. 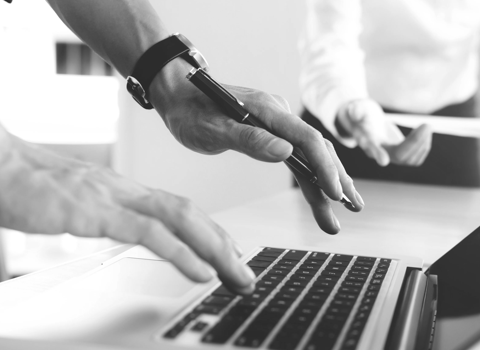 All special application nosings offer a way of taking positive steps to minimise the risk of accident and injury, in one of the most obvious areas in which such risks occur. The Latham Asbraloy Super Visual Range of treads are specifically designed to meet the needs of AS/NZS 4586:2004, AS/NZS 4663:2002, AS/NZS 1428.4:2002, AS/NZS 1428.4.1:2009, AS 1428.1:2001 (AW735 S, AB735 S, AW745 ST, AB745 ST), AS 1428.1:2009 (AW755 S, AB755 S, AW-FA501 S, AB-FA501 S, AW734 ST, AB734 ST, AW-FA711 ST, AB-FA711 ST), AS 1428.2:1992, AS 1428.3:1992 in terms of visual requirements, whilst maintaining the slip resistant architectural finish. 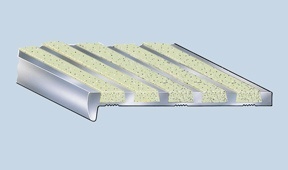 Latham Lumo Luminescent Stair Tread Nosings feature a glow-in-the-dark luminescent infill. The lumo luminescent pale green infill temporarily glows in the dark after exposure to artificial or natural light. The contrast of surface to the safety tread is ideal in any location which experiences temporary darkness, such as stairwells, emergency exits, entertainment facilities and theatres. Latham Asbraloy Aluminium Illuminated Slip Resistant Safety Stair Tread Nosings feature the newest safe low voltage 24V LED lighting technology, which is cheap and efficient to run. For most applications all necessary hardware is supplied, including transformers which will simply plug into a power point. Latham Asbrabronz Solid Brass Illuminated Slip Resistant Safety Stair Tread Nosings feature the newest safe low voltage 24V LED lighting technology, which is cheap and efficient to run. For most applications all necessary hardware is supplied, including transformers which will simply plug into a power point. Safety Stair Bars highlight the leading edge of the step, or make ramp or flat surfaces safe, and are filled with slip‑resistant Suregrip silicon carbide mineral granules for heavy and light duty applications. They are available in both aluminium and solid brass. The Latham Re-Surfaceable Slip Resistant Stair Tread Nosings combine Latham Flex-Tred Slip Resistant Tape with aluminium extrusions. 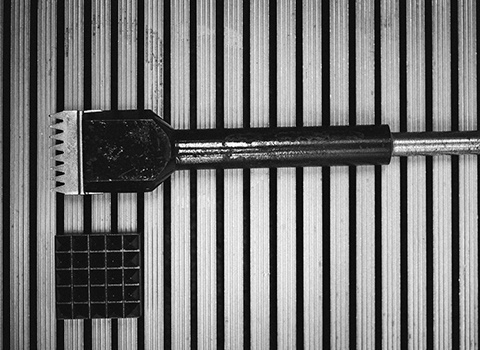 This ensures a superior fixing is achieved, as compared to that of tape on tile or concrete etc. 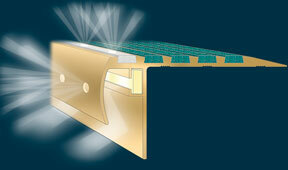 All Asbra Resilient Nosings are supplied cut to length only. 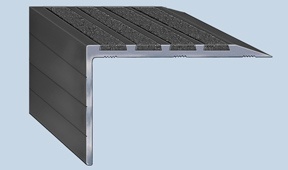 Asbra Resilient Stair Tread Nosings are filled with resilient preformed inserts for use in light commercial and domestic applications. This product is not an Asbra safety product and does not have the same slip resistant qualities. The infill may shrink. 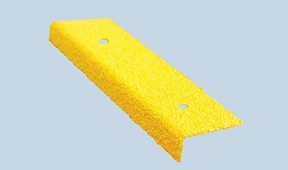 Latham Light Duty Abrasive Resilient Stair Tread Nosings consist of a preformed PVC strip containing abrasive aluminium oxide granules supplied separate for fitting into the supplied aluminium base during installation. For aesthetic and service conditions where Stainless Steel is required. Latham INOX Stainless Steel (Type 304 brush finish) Resilient Stair Tread Nosings are supplied with a resilient PVC insert for high quality commercial applications. They are available in a variety of styles for specific type application. This product is not an Absra Safety product as it does not have the same slip resistant properties. The range of Latham Rufazel Slip Resistant Products has been designed and developed to fill the need for an aggressive grade slip resistant surface where normal commercial surfaces are inadequate. 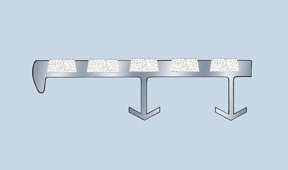 A number of Latham Asbraloy™ and Asbrabronz™ profiles can be curved to convex and concave radii. The actual achievable radius will be dependent on whether the profile is to be curved in a convex or concave fashion and also the material type and profile.